Today’s workout is focused on building strength and shape in the body. Often people think that to get a great shape they need to do a ton of cardio to burn fat. Burning fat is great, but you also need to build muscle. Muscle is what gives your body shape and strength. It also improves your metabolism. Many women are afraid of building muscle because they worry more about the number on the scale than the way they look and feel. Even if the scale is moving more slowly than you want (or not budging at all) you will see the signs of fat loss and strengthening. Your body shape changes, your metabolism and energy improve. Your endurance and physical abilities improve, and this is linked to improved confidence and a more positive body image. So go ahead, grab some weights and challenge yourself! I also posted a 10-Minute Jump Rope Workout below to pair with this routine. Personally, I always find jump rope challenging (in a good way), sometimes frustrating (I always seem to step on the rope when I am filming), and fun. It adds a great full body cardio blast to any workout to increase the burn. Update on my workouts: For the last two days I have been flat out Exhausted. That capital E is on purpose, that is how tired I have been. I did not get in any formal workouts. I did a lot of general activity around the house after work on Friday and yesterday, but I did not hit my steps. I aim to get at least 10,000 steps per day, but I was around 5000-6000 both days. I took a looooong nap yesterday and got plenty of sleep last night so I am planning a workout for today. I know that the more I move the better I feel, so I want to get back on track, while also respecting the fact that I am almost 28-weeks pregnant and definitely going to be more tired than normal! 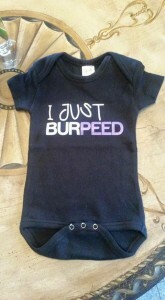 Keep an eye out for a future workout featuring Baby Bender in his adorable onesie! I have been cooking up a storm. Yesterday’s new food trial was homemade hummus. Yummy! Do you have a favorite hummus recipe? There are so many great variations! Have fun with today’s workout! *If using body weight reps can be increased to 15 or 20. That onesie is too cute, it is going to be really fun to see his up coming cameos. Home made Hummus with any fresh herb is a house hold favourite. Right now in my fridge I have some made with fresh thyme.